Changing lives starts by developing solutions that give more back to patients than just time, but quality of life. Eliminating issues of compliance and persistency as a core building block of the platforms for multiple drug classes. Viking Scientific is unlocking the potential of drugs by providing unparalleled control over drug delivery kinetics. Millions of dollars are spent developing breakthrough products that demonstrate remarkable results in the laboratory but fail to launch due to safety or efficacy limitations imposed by the dosage form. 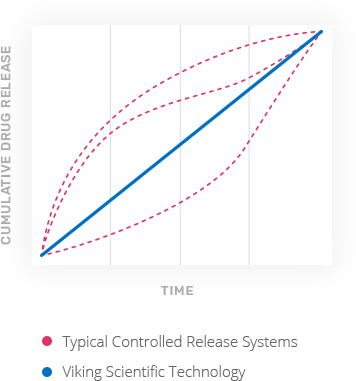 Our technology can provide consistent, sustained release of drug from a single treatment, which eliminates the peaks and valleys of drug concentrations that occur when patients are continually re-dosed. Viking Scientific hydrogels can be custom-made to deliver a drug at the exact rate it is needed, which can breathe new life into difficult-to-deliver drugs that are limited by their narrow therapeutic window or toxicity. The opportunity doesn’t end there: products in the pipe along with products that are at the end of their patent life can utilize our technology to provide a unique delivery benefit, extending product life and marketing advantage. The issues of compliance and persistency are front of mind for patients, caregivers, and physicians. Our unique hydrogel platform can free patients from the dosage schedules of the products they take. One injection, tailored to the dose prescribed by their physician, is all that is needed. Our platform can provide a customized solution across most drug classes for days, weeks, or months. Compliance and persistency issues become a thing of the past. No drug wastage, no insurance issues, one co-pay, and one office visit to receive their drug from the prescribing physician. We have eliminated undesired burst or fluctuations in dosing that limit the effectiveness of many drug delivery systems today. Viking Scientific has the technology to provide consistent and sustained dosing from biocompatible, biodegradable hydrogels. While other technologies face the challenge of loading drugs into pre-formed polymers, Viking Scientific hydrogels are built from the drug molecules themselves, using drugs as links in a molecular chain. By controlling the rate that these chains degrade, drug is delivered at the exact rate that the hydrogel breaks down. Viking Scientific has protected its intellectual property by filing extensive patent claims (patent pending) in order to protect the entirety of this platform’s capabilities. We expect that this will put us in a strong position to leverage the plug-and-play capabilities that will make up the future of drug delivery. Our platform claims nearly all drug classes, therapeutic indications and specific uses.